The Land of K.A.‘s photography theme this Thursday is all about fun! I have a few of… who else? You guessed it! My kids having fun! So I have alot to learn about photographing during a bright sunny day. OK, enough blabbering… here’s my photos of fun! 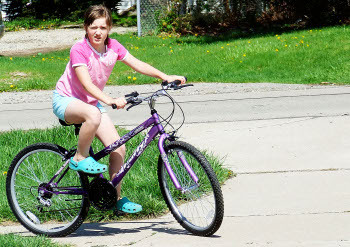 Mikayla had her birthday this past Saturday and from us, her dear ol’ parents, she got a new bike! A purple 15-speed Huffy Lakota at that. 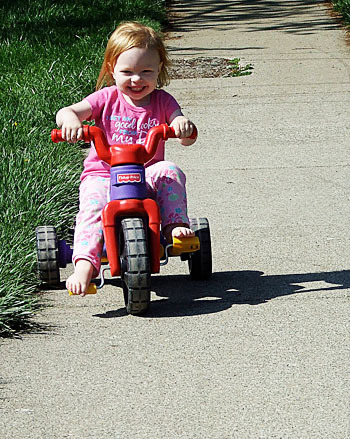 Super nice and Mikayla loves zooming along. Daddy is going to teach her how to use the different speeds this weekend. Gosh! In this photo she looks all grown up! She’s only 10, though. Rachel wanted to ride her bike with sissy. And Josh looks in on the fun! Check out more Theme Thursday photos over at The Land of K.A. 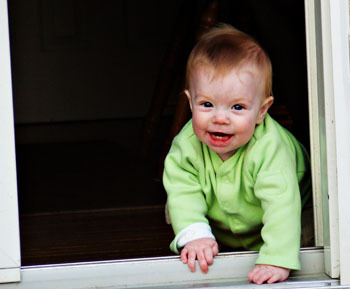 15 comments to Theme Thursday: Fun! Just look at those grins! Fun for sure. Happy birthday to your eldest! I find it’s often not the technically perfect photos that I love the most. these are so adorable! great job! 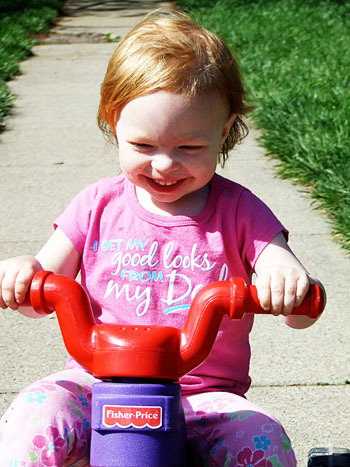 love those trike pics — she looks really pleased with herself! bikes are the bestest ever! Those are great shots of the kids having fun! Those middle ones…could she get any cuter?? That grin is just fabulous. I know what you mean about the kids reflecting light like aluminum foil. I definitely have that problem here, too LOL! Was there any better Christmas/birthday/holiday than the one where you got your first bike? I still remember mine. My cousin, Jason, helped me outfit my bike with a deck of my grandparents good playing cards so I could pretend it was a motorcycle. Heaven!! Those are all adorable – I especially love that last one! Oh, they are all so cute! oh those smiles on rachel and josh! too cute!! the harsh sun is definitely hard, but i think you captured the FUN – and that is the important part! LOVE that last one best, they are all great though! The kids are getting so big! GREAT shots! I always loved bike riding as a kid – so much fun! Very cute bunch of pictures! I love that red hair! Looks from daddy? Look like a lot of fun! Very cute!! So if I happened to get hooked myself on all these photog boards your linking to and get the guts to post on them some day….you won’t think I’m stalking you or anything will ya?? My name is Christine. I am wife to my soul mate of 11 years. Homeschooling mama to 4 kids. Amateur photographer. Southern girl living up north. Child of God.